These discs are ideal for removing paint, primers, epoxy, rust, tar, etc... on metal surfaces, steel and concrete. € 99,95 Inc. tax, ex. shipping. 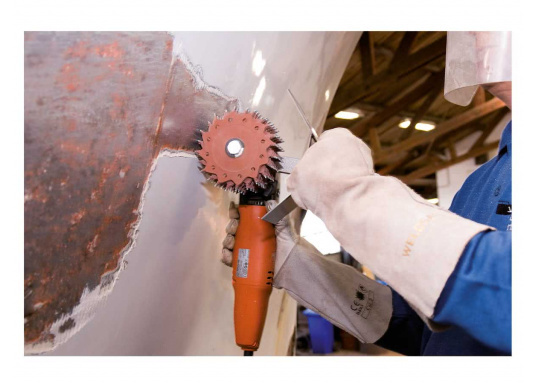 Tercoo® is a rotating disk, which can remove rust, paint, tar, epoxy, varnish, adhesive-coatings ect. from a variety of surface materials, such as: steel, iron, other metals, concrete and stone. The perfect result is a blasted surface with a corresponding roughness and purity, which can then be easily adapted to install new protective layers. With Tercoo®, one can get a proper surface, from which he can go on to apply new protective coatings on top of. Tercoo® is a natural rubber disc, equipped with 12 hard metal studs. The studs sit at a certain angle to the center middle and are pushed by centrifugal force outwards. The natural rubber discs are flexible and elastic and create an effect very similar to what a sandblaster is capable of. The hard metal pins scrape the surface clean of tar, adhesives and sealants and are therefore easy to remove. This is not the case with other tools of this nature, due to their operational tendancies, which create friction and heat. It does not matter which material is on the surface, Tercoo® always gets the job done. Single: is suitable for smaller surfaces such as the removal of water bubbles in paint or minor rust spots, etc. Double: is suitable for medium sized surfaces, such as keels or smaller decks. Triple: is optimal for large surfaces, such as hulls or entire decks. 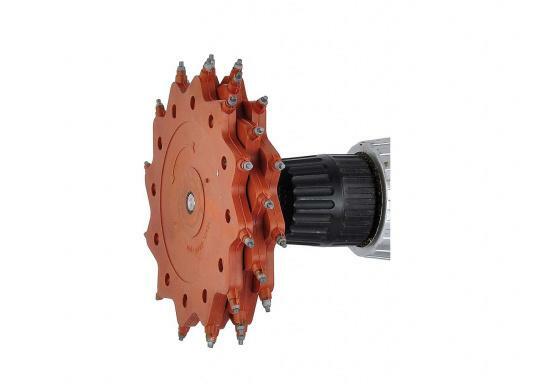 Driven by a drill with a recommended rotation of between 2500-3000 RPM, it generates shaking and swinging movements for a result close to what a sandblast would reach. The discs are ideal for removing paint, primers, epoxy, rust, tar, etc., on metal surfaces, steel and concrete. Available as single, double or triple disc (works three times as fast). Working surface approx. 4 to 6 m²/h (single disc). Lifetime: approx. 90 - 120 m². Locking bolts: 8 mm, disc diameter: 126 mm. Disc width, single: approx. 7 mm, double: approx. 13 mm, triple: approx. 20 mm. Please note: In order to be able to use the TERCOO disks with greater ease and with less dust, you can order an optional guide rail with bar spacer and exhaust system.